There’s a place near Port Sydney that I want to use in one of my stories. 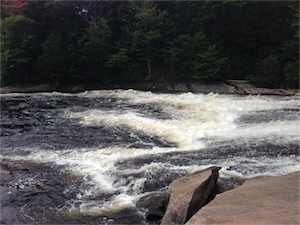 It’s very Muskokan — big dam, tall trees, lots of rocks and rapids. Of course, for my story I need to relocate and put it near this other place, which is actually several hours away. But when your stock in trade is making stuff up, that’s no big deal. I’m lousy with directions, anyhow. Even a made-up story needs some basis in reality, though, which is where the research comes in. I collect settings with photos and videos. That’s what I was doing at that place near Port Sydney, this past weekend. As an added bonus, there was a real-live group of teenagers there, hanging around and sliding down the rapids pretty much exactly the way the teens in my story would be doing. Now I had video of how it was done, from approach to recovery — where they stand at the top, how they sit to slide, where the current pushes them, where they swim clear. Jackpot! So yeah. Bright yellow, poofy lifejacket. Waving an iPhone. Inconspicuously. One of the boys approached, politely. I cringed. How to explain that that was exactly what I was doing, without sounding like a creepy old lady? Of course, if he asked, I’d erase the video. I didn’t want to, but I would. Yay! Lacking pen and paper, I wasn’t sure how to trade email addresses until my tech-savvy husband pointed out that the iPhone in my hand could, in fact, be used for such things as information exchange. Huh. Who’d have thought? That dealt with, it was time to experience the water first-hand. Not the slide down the rapids; it’s been a long time since I was a teenager, and that part scared me. I waded into the lower part of the lake-river-pool, where the current swept from the waterfall to the far shore before curving back around. It was take-your-breath-away cold, at least at first, and the algae-slicked rocks made for tricky footing, even with my grippy-yet-stylish water shoes. The pull from the current didn’t feel too strong. Maybe earlier in the summer, when the water was higher, but not now. I waded to waist-high, then swam. A second later, I tried to stand up again. No rocks. No sand. No bottom. I pushed myself lower, as low as the lifejacket would let me go, and couldn’t touch. I looked back — I was farther from shore than I thought. That had happened fast. Research, I reminded myself, and paddled into the white-churning water. Before long, though, I was driftwood, swept along the arc of the current towards the rocky-sloped far shore. But that was okay. I’d seen the kids do it. They let the current push them to a certain point, and then cut across. I waited until I was in about the right spot, then started to swim. Nothing happened, except that my lifejacket bobbed up and tried to pin my arms together. I wrestled it down. The waterfall was a lot farther away than I thought it should be, given the strength of the current. The water here had looked calm enough. But my kicking wasn’t doing a whole lot of good, and the ancient, reptilian part of my brain was starting to clamour that being in the water and not completely in control of one’s location was not a good thing. I don’t tend to panic easily. My reptile-brain reaction tends to be of the time-slows-down variety, leading to absurdly calm, inane comments like “This isn’t good,” while spinning in circles on an icy highway. Shaky-knees time comes later. Still, I was groping for a backup plan. The current couldn’t last forever, right? Eventually I’d be able to swim across, and then I’d shove my way through the underbrush and hike back to the dam. I had a lifejacket on — I wasn’t going to drown. But a deep-inside part of me was starting to quiver, because the weeds were getting close. There’s a large grey area between “in danger” and “in control,” and I wasn’t at all where I wanted to be. Around this time the boy who’d spoken to me was walking away from his friends, towards the end of the rocky beach — the last easy landing place before I was swept downstream. Walking with purpose. Which filled me with an odd mix of gratitude, relief and embarrassment. The boy wasn’t that much older than my daughter, and I can swim, darn it! Maybe never before in a place like this, but I can swim. Side-stroke. Not glamorous, but my strongest stroke, and one that didn’t result in my lifejacket trying to throttle me. I don’t know if it was just because I was farther from the waterfall now, but I was finally able to kick free of the current and make my way back to shore. The boy waited there, in a non-committal sort of way that made me feel less like a complete idiot. A kindness. I don’t remember what we said — my brain wasn’t fully engaged yet. Something about the rocks being slippery. Something about the current. I asked if anyone in the group was a lifeguard, thinking it astonishing, now, that they risked the water without lifejackets or rescue boats or trained dolphins to drag them to shore. Whatever people say about teenagers these days, there are some pretty great ones out there. I don’t remember if I thanked him. I hope I did. He headed back to his friends and I pulled myself out of the water. Maybe I’ll stick to photos and videos for book research, at least for a little while. I smiled at her and explained that there was no way on this lovely planet of ours that she was getting into that water, now or ever. And then we went home. Erin, what an incredible story! And what an amazing ability you have to take what had to be a terrifying experience and make it hilarious. Love the title of this post and glad you lived to write the story you were doing the research for. Thanks for taking time out from your “real” writing to entertain your readers with this post!